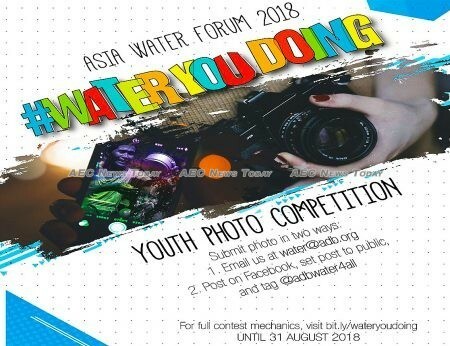 The Asian Development Bank (ADB) has announced a youth photo contest dubbed WaterYouDoing?, aimed at showcasing the contribution of youth to water awareness, water services, water resource management, and water security in Asia and the Pacific. The competition is part of the upcoming Asia Water Forum (AWF) 2018 scheduled for October 2-4 at the ADB headquarters in Manila, with a theme of “Information, Innovation and Technology”. Some 300 participants comprising government officials from ADB developing member countries, industry and water association representatives, and interested parties from the private sector and civil society are expected to take part in the two-day event. Participants in the conference will hear about and discuss the latest matters relating to water management and strategies that can be adopted and scaled up with innovation and technology. The conference will also showcase the creative ideas or new innovations by the regions youth to enhance the sustainable use and/or management of water in the five main areas of ADB’s water operations: sanitation, water quality, water for food, water for energy, and water resources management. ADB’s Water Sector Group chief Thomas Panella said “despite Asia’s rapid progress, serious challenges remain and we have to keep the profile of water high on the region’s development agenda. The ADB WaterYouDoing? photo competition is open to all amateur photographers aged between 18 and 32 from ADB’s member countries. Photos submitted must be original, taken personally by the participant, and have not been published previously. Photos can be of people, places, projects, or types of innovation that show youth’s unique contribution to any of ADB’s five major water activities. Submissions should come with a caption of no more than 150 words explaining the photo and its location. Participants may submit as many photos as they wish. Entries can be sent by email, but participants can also post photos on their Facebook account, set the post as public, and tag the ADB Water for All page, using the hashtag #WaterYouDoing. They can also post photos on their Instagram account, set account as public, use the hashtag, and tag the ADB HQ account. There will be six winners: one for each of the five water activities (Best Photo Awards) and one People’s Choice Award for the most likes and reactions on Facebook or Instagram. All winners will receive an all-expenses paid trip to Manila to participate in the AWF. Photos can be submitted and posted until August 31, 2018. More information on the rules and guidelines for the competition can be viewed here.